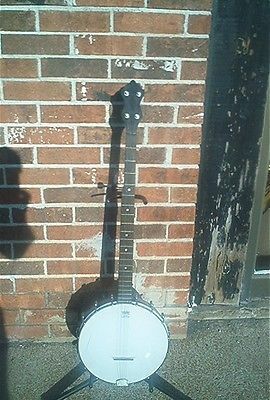 1930’s Stromberg 5 String Open Back Banjo. Flamed Maple Neck, Rosewood Fingerboard, Birdseye Maple Rim, Rosewood Veneer on Back of Heel, Rosewood Veneer on Back of Rim, Rosewood Headstock Overlay. New Remo Head, New Grover Friction Peg Tuners. 18 Bracket, Cast Rim. Some Rust and Pitting on Metal Parts. Great Sounding, Great Playing Banjo.